Last November scientists from the European Space Agency (ESA) achieved the first ever landing of a probe on a comet when Philae touched down on the surface of 67-P Churyumov-Gerasimenko. 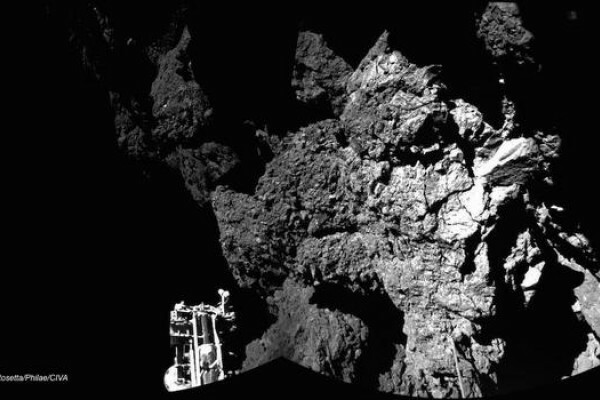 This week the journal Science has published seven key papers detailing the discoveries made by Philae on the surface of the comet, which is more than 4.5 billion years old and assembled from the same material that spawned our planet. Chris Smith spoke to two mission scientists, Andrew Coates and Geraint Morgan, to get their take on the findings. Andrew - So, one of these papers is actually talking about the strength of the comet and it was a hard surface but underneath a much softer surface which seems to be stuff which has come out in the cometary eruptions which were going on all the time to produce that cometary coma and the tail and everything. Chris - So just sort of summarising that then, what we've learned is that the surface is extremely hard like an iced cake and it's a softer, sort of "meringuey", soggier stuff inside. Andrew - Well, yes it's softer inside, but on the surface, it's very hard. Now, I mean some of these is a big surprise. So surprised that it was so hard, but we've known about cometary crusts since the time of comet Halley actually when we had the Giotto spacecraft went pass comet Halley. So, one of its big discoveries was the fact that comets are dark, there's jet activity, there's also these crusts. So, every time a comet goes around the sun, it's sort of roasted by sunlight and produces lots of volatile material, the water and so on from underneath the surface which moves away, leaving this crust. So now, we've been able to sort of taste and feel a crust to see how hard it is. Chris - As well as feeling the surface, Philae has been sniffing it too although in the way the mission team had planned. When it landed, the probe bounced several times before it came to rest, leaving it sitting on its side and concealed under a cliff. Because of that, the drill that the Open University's Geraint Morgan and his colleagues were going to use to sample the chemistry of the comet was out of action. But all was not lost. Geraint - What we ended up having is samples coming in through our exhaust pipe. The way we vent our mass spectrometer system is through an external pipe and we believe that what happened was when we hit the comet, it threw up a big dust cloud and we ended up basically analysing that kind of dusty cloud that was generated from the impact. And so, we were able to get gas into the mass spectrometer that way and that's what we call it now a "sniff" or "scratch and sniff" mode. Chris - What did your "scratch and sniff" show? Geraint - What we found was that as expected, the primary components of the comet are water. You also have carbon dioxide, and carbon monoxide. But you actually have a lot of organic compounds present as well. We believe this is because the idea was comets would be kind of a mix of black and white basically but we now think that the comet is actually very, very dark. We know that from albedo measurements of the surface. It's a very dark, dark surface. The probability is that you get photochemistry happening which then converts water and carbon monoxide and carbon dioxide into a polymeric compound. So, it's a long chain of carbon, hydrogen, and oxygen molecules. And that's what forms the kind of crust on the outside of the actual comet. Other measurements have suggested that this is several centimetres deep. But underneath, you then have the ice and the gases and those are what then form the tail of the comet. Chris - Chemically, what are the implications of what you found? Could they be delivering important organic compounds to nascent planets like the early Earth? Geraint - The simple answer is yes and what surprised us was, how diverse and complex the organic compounds were. And you know, you'll obviously get a lot of chemistry going on there which means that you can build up quite complex molecules. The one thing that was a little bit surprising was that we didn't find very much nitrogen. So of course, if you want to form amino acids and things like that then you need the nitrogen as well as the carboxylic group. Chris - What is coming next then? Geraint - Well, the Rosetta mission itself continues well into next year. The orbiter craft will obviously go through perihelion and will measure, look at what happens to the comet as it gets closer and closer to the sun and then comes away from the sun. In terms of the Philae lander, unfortunately, we've not had communications I think with just over 2 weeks now. The difficulty with the lander is that because we believe we're under a kind of cliff, it's getting the antenna in the right place for a long enough telecommunications and trading off that with the risk of potential damage to the orbiter craft if we try and fly too close. So, as it stands now, the orbiter is now concentrating orbiter science, but it will continue to look for the lander. If they can, it will pinpoint the lander and try and communicate with it and continue activity. But some of the best brains in Europe are working on this and I'm sure they will come to a conclusion fairly soon. Previous Are street lights necessary?